Memorials are suggested to Wright Cemetery, El Dorado Springs, Mo., or Pleasant View Retirement Community, Manheim, Pa.
Della Whitesell, age 93, of Manheim, PA, (formerly of El Dorado Springs, MO, and McPherson, KS), died April 11, 2015. She was born April 20, 1921, in Bates County, MO, daughter of Grant and Nettie Jackson Black. She grew up in Bates County and Cedar County, MO, and graduated from El Dorado Springs High School in 1938. In 1939, she married J. Paul Whitesell. For most of their married life, they farmed southeast of El Dorado. She loved to cook, and after her children were gone from home, she worked part-time at Sibley and Thatch in the bakery, and later operated the El Dorado Sale Barn Café. She taught dozens of young men and women how to cook during many years of serving as community leader and cooking leader of the Cherry Valley 4-H Club. 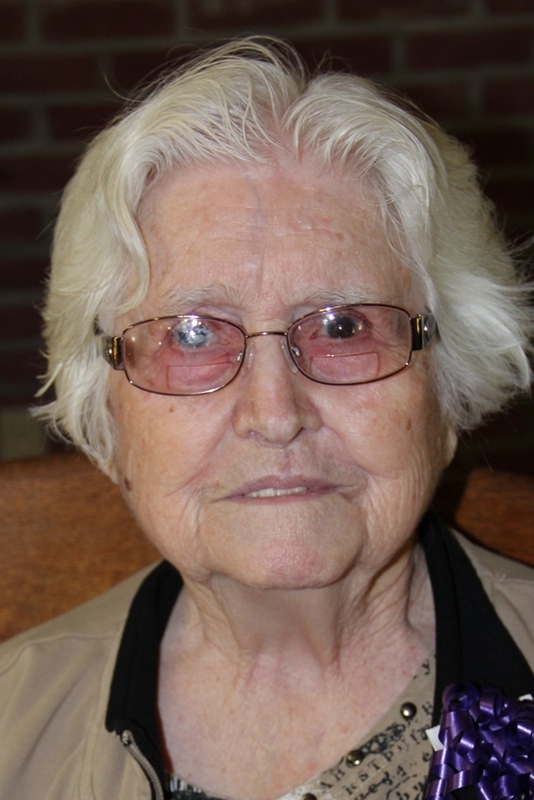 She also was a volunteer with the Cedar County (MO) Memorial Hospital Auxiliary and the Wayside Museum, both in El Dorado, and The Cedars in McPherson. She attended the Park Street Christian Church and Filley Christian Church in El Dorado, the Church of the Brethren in McPherson, and the Annville Church of the Brethren in Pennsylvania. She lived in rural El Dorado until 2002, when she moved to McPherson, where her daughter lived. In 2006, she moved with her daughter and family to Pennsylvania. She was a resident of Pleasant View Retirement Community for six years. Survivors include: daughter, Kathy (Ed) Hackleman, Cornwall, PA; son, John (Rita)Whitesell, McCune, KS; grandchildren, Shari Cooper, Kansas City, MO, Jeremy (Emily) Hackleman, Cornwall, PA, and Jimmy Whitesell, McCune, KS; great-grandchildren, Josh Cooper, Kansas City, MO, and Andrew and Tyler Hackleman, Cornwall, PA; step-grandchildren, Keeja Andrews, Lawrence, KS, and Mahriya Meister, Carthage, MO; and six step-great-grandchildren. She was preceded in death by her husband; a daughter, Margaret Joan Nelson; a sister, Emma Newcomb; and seven brothers, William Black, Frank Black, Alba Black, Charley Black, Earl Black, Rolla Black and Orville Black. Funeral services will be at 2 p.m. Saturday, April 18, 2015, with visitation from 1 to 2 p.m. at the Bland-Hackleman Funeral Home in El Dorado Springs. Interment will be at the Wright Cemetery, rural El Dorado Springs. Arrangements are under the direction of Bland-Hackleman Funeral Home.